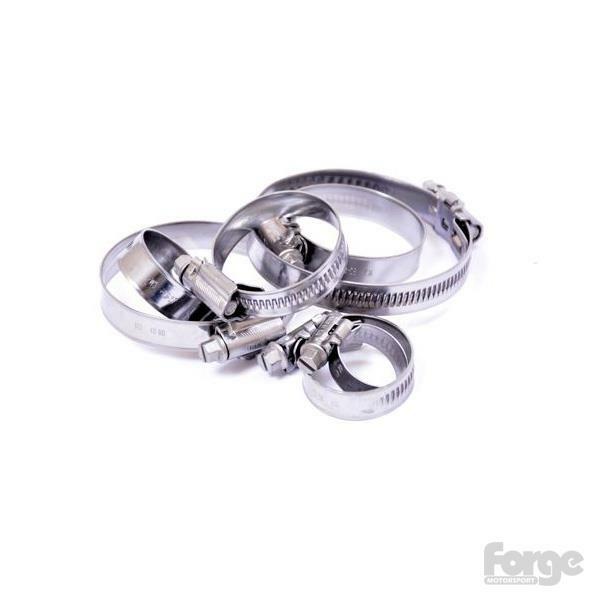 Forge Motorsport Hose Clamp - Pann Auto Performance - San Diego largest aftermarket automotive performance parts - What do you drive? In order to ensure that you have the correct hose clamps for your hoses, we have put together a full kit, to ensure a perfect fit. These worm drive hose clips are made entirely from 18/8 marine quality stainless and are regarded universally as being the highest quality clip available in the market today. The band threads are pressed in (rather than perforated) which enhances the thread strength and presents a smooth and snag-free band surface to the hose. Their tough construction will stand a great deal of abuse. They are manufactured to BS5315 and have BSI KITEMARK and N.A.T.O. approvals. They have Lloyd’s Register Type Approval for marine, offshore and industrial use. These hose clips have fast become the industry standard for marine applications throughout the world due to their high quality and performance. Universal Hose Clamps also available.